Why buy one auto mount for your Dell Streak 5 when you can get two mounts for the price of one? With our 2-in-1 cupholder/windshield mounting system, you can mount your device in the most convenient spot based on your needs. The Gomadic flexible windshield mount holds your Dell Streak 5 in an optimal position for hands-free use. The 9.5"" flexible arm dampens movement and vibration as you drive, and a simple twist swivels the viewing orientation between portrait and landscape position adjusting in seconds with only one hand. 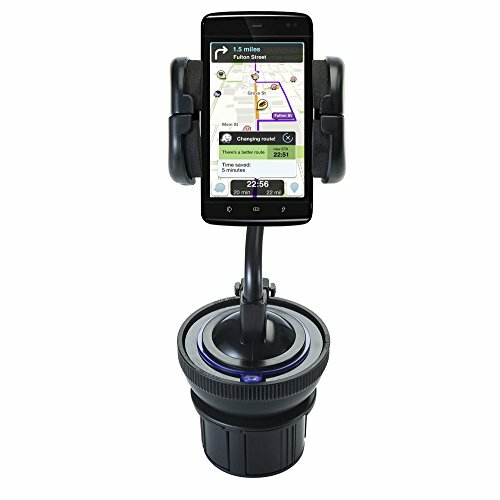 With a lock-and-release lever, the suction cup makes transferring your device from one vehicle to another a breeze. For those times when you want to leave your windshield unobstructed the hassle free universal cupholder mount provides convenient access to your device from your car / truck cupholder. Both mounts can be installed and removed in seconds, making it convenient to move from one car to another, while eliminating any threat of theft. This is the perfect mounting kit for your Dell Streak 5. Expandable bracket/cradle holder for the Dell Streak 5 easily accommodates 153.1 x 79 x 10.2 mm. Shock-absorbent foam inserts on the bracket/cradle holder expandable arms protect your Dell Streak 5 for bumpy rides in any car / truck while the flexible, but stable neck dampens movement and vibration. Two in one mounting kit expandable cupholder and flexible windshield mount let you choose where to secure your Dell Streak 5. Cupholder attachment provides an ideal mounting surface to provide stability for your Dell Streak 5 in most every standard vehicle cupholder. The Gomadic unique arm bracket/cradle holder includes a flexible articulating neck with 180 degree range and 360 degree rotating head for easy positioning of your Dell Streak 5.